Mother-of-two Aysha Frade was looking at her phone and was “completely unaware” that murderous Khalid Masood was about to mow her down in an SUV during the Westminster terror attack, an inquest has heard. The 44-year-old had her back to the Hyundai Tucson when she was hit and thrown in a somersault around 17.4 metres, landing in a bus lane on Westminster Bridge on March 22 last year. Her head and shoulders went under the side of a slow-moving number 53 bus and she was killed instantly when its back wheel passed over her. On Wednesday, the inquest into her death heard she had no idea what was about to happen, even though Masood had already hit five people, killing two of them. Detective Constable Simon Osland took the Old Bailey through a video compilation of CCTV clips of Mrs Frade’s final moments. 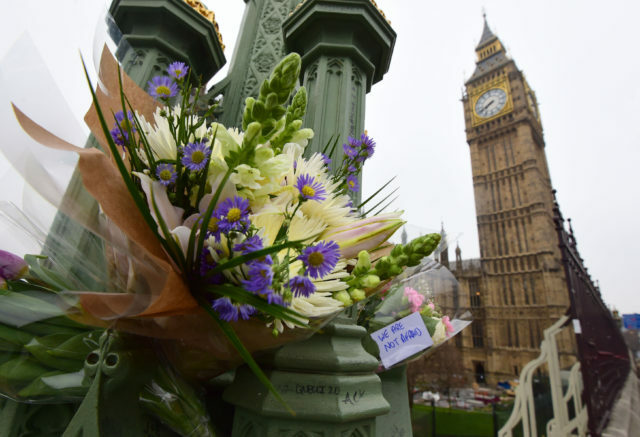 Masood was driving an average of 31mph when he deliberately knocked down Kurt Cochran, 54, Leslie Rhodes, 75, Mrs Frade, 44, and Andreea Cristea, 31, on Westminster Bridge before stabbing Pc Keith Palmer to death at the gates to the Palace of Westminster. Members of her family sat in Court One of the Old Bailey looking down at the ground as graphic and distressing footage of the tragedy was shown. Mr Patterson said there was hair on Masood’s car, suggesting she hit her head on the windscreen. The lawyer for the family said a pathologist had concluded her death would have been “instantaneous and would have been without suffering”. Mr Patterson said graphic photos and videos had been posted on the internet of Mrs Frade’s body by passers-by, causing “real distress to the family”. Bus passenger Rob English picked up Mrs Frade’s phone from the road, and answered a call from her husband John. Rob Lyon banged on the side of the bus in an attempt to stop it, moments before Mrs Frade was crushed under its wheels. Masood’s car had missed him by inches, while his colleague was forced to climb the balustrade to get out of his murderous path. He said: “There was a crunch sound, the curbing of a wheel, of a car high-revving. Mr Lyon said Mrs Frade was about 10 metres away when she was run over in a “split second”. Mr Lyon said he was so close to the incident that he heard the sound of the bus running over Mrs Frade and the effect on her body. He estimated the Hyundai was travelling at about 40mph when it ploughed into the pedestrians.